Good morning! It is such a relief to see the sun shining over Edinburgh today, still bitterly cold mind you but it gives me some hope that spring hasn't forgotten us entirely... let's just gloss over that fact that the snow will be back with a vengeance tomorrow, shall we!? Happy Thursday everyone! I would say 'happy spring' but you know... it's not really! Great interview, I love the crochet cardigan! Just popping over to read it! What a lovely little interview. I enjoyed it very much. Very inspiring and the pictures are beautiful. Love that grey cardigan WiP of yours... I personally have a tendency to work a lot with colors just winging it. I find it very refreshing with a calm solid project like that grey one. And the pattern is so pretty. Thanks for sharing this today. Love the interview and I love her blog! 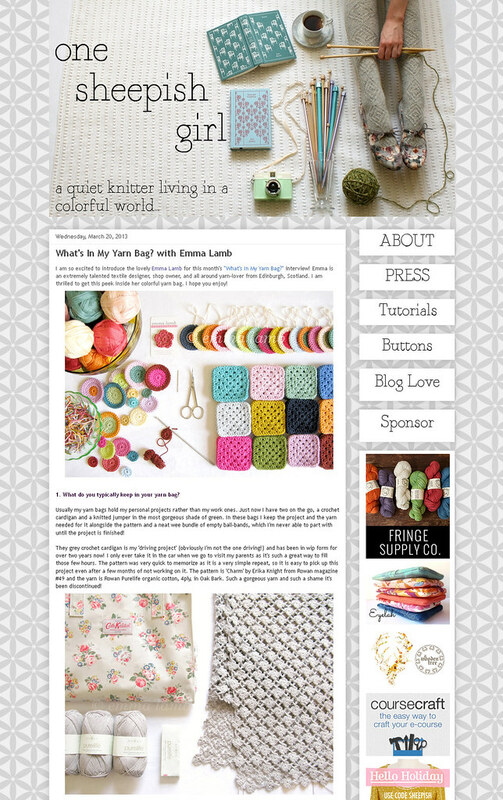 Ahh, i've loved her blog for some time now and just recently discovered yours. Love finding other Edinburgh-based blogs! :) Such gorgeous photos as usual. I love Meredith's blog, her work is always so creative and inspirational, like yours!!! I am fairly new to yours. Hope Edinburgh is not too cold, its pretty chilly here in the NW of England?! Emma, thank you for the introduction to Meridith's site. The interview was fun to read. I'm also one who prefers to work on knitting or crocheting in the quiet of home. My exception is that I do like having a project to work on when taking a multi-hour train ride...even if I might have to unravel all the travel stitches afterwards.